I like guys with medium langth hair, like yours. I don't have a choice in taking it easy. It hurts too much to move. I did take Kibby to see some fireworks lastnight at a local festivill. They were good. we went to Wal-Mart to get some snacks, she had to walk back to get them. The fire works were very good. I have a cardialichis (Heart) Dr. tomorrow for other problems. I am going to ask him about back also. Or make an appt. for regular Dr. while I am up there. I will be staying the night in Charletsvile Monday. I have appt. on Tues as well. mawra get well soon, I'm slowing healing from the work that was done the left hand, feeling came back to my pinkie and part of my ring finger, It still stiff and sore, but I'm glad to be able to type with both hands. I went to a fall fest and pick up some nice ornaments, had a nice lunch, and I'm just a tad tired from that. Glad the surgery worked for you, Ginny. Hans...you having a mid-life crisis ??? NAW...I don't believe it, you're always way too busy doing all the things you love to do and leading a life that is way too interesting to have one of those gawd awful things!?! but this is quite a nice change and seems to help you look a bit more easy going and relaxed... Southern California style...OH YES !!! Drat the fact that you;re already spoken for! Uh, and so I am, of course Uh, yes, Marjon, I'll be there right away! Hans, with your hair just a little longer and styled nicely you would make a good Robinton. "Oh high sweetheart , just talking about you"
Briefly caught up on the last two pages. Ginnystar, wishing you a complete recovery. Hans, great photo. I agree with LM about the Artsy look. I survived the week. I hope next week has less "emergencies". Everyone is fine but the youngest tried to take out his newly healed left elbow with his friend's frozen water bottle. The oldest seem to have everything but nothing serious with him this week and couldn't (in his mind) complete cross country practice Finally, I have some difficult parents this year. Don't get me wrong as a parent of a child with autism who had to battle his school district I understand. However, these parents are not being rationale and they are making it difficult to teach their child especially when they call the class room multiple times and demand to talk to me. I've often said to them, "I need to go now. I need to finish the lesson with your child. You may call or email after school." Otherwise, the oldest (one with autism) is blossoming in high school and we will be discussing fading out his one-on-one in Jan. I'm scared and happy. I've always know he has the ability to be independent but its scary thinking about him without the support on campus. Thankful it will not be 0 to 60 fade out. For those over the pond in England, he wants to go to Oxford or MIT (on this side of the pond) and study physics and aerospace engineering. Any advice for him. Thanks. I'll admit I like the idea because then I have more reasons to go visit... just need to save the money. I was not an Oxford or MIT grade student but I am a physicist (I'm currently in the twilight zone between PhD student and postdoc). My advice to him is to read around the subject. There are some good popular physics books and magazines out there and showing interest is important. He also needs to pay attention to his maths. Having a good maths background is important. My maths education is a bit patchy and I really wish that my maths was stronger sometimes. I can't help with the whole Oxford/Cambridge interview thing I'm afraid though. Not much going on here. Kibby is off to Star Trek Halloweeen party. Along with Mom and my sister. My back is a tiny bit better. Or it was before I went to yard sales and flea market today. Trying to get some Christmas stuff. Hello everyone, I haven't been on here for a while and thought I'd say hello. I hope that everyone stays safe through hurricane sandy. Should he hang on to the old, should he grab on to the new......"
The Bellamy Brothers, geez they were already playing when I was young! I have had a few songs on my mind, but till I heard them on the CD or at the show I don't know who sang them. And what should he ignore. In a world gone totally insane. Draco...this little poem of yours went all the way to the bone marrow. My husband and I think this has a very current feeling to it...especially for people our age. Both of those are lyrics to Bellamy Brothers songs; the first is the original "Old Hippie", while the second is the lesser-known sequel they did ten years later. In response to absolutely no requests, I thought I'd put up all the lyrics to "Old Hippie" and its sequel. Thanks Draco...I know just how that guy was feeling...only he needs to add a couple of new verses...because we're all a whole lot older now. Well... at least those of us that are left, from our somewhat overly indulgent generation. If I'd been out 'til quarter to three, would you lock the door? Maybe we should start a MoM Geriatric Section on the board? for us *Oldsters* or what my hubby calls *Mainly old MoMers* [he says it still keeps with the *MoM* theme]. On our first duty station my husband and I had a party line, on our only home phone. Now it seems that everybody's got a cell phone, even the family pet !! When I was in the Army, I learned to type on a very, very O L D manual typewriter...and they wonder why I have a problem with computers !!! And my Grandparents had the first TV I ever saw when I was about 5 or 6 years old, the screen was only about 8 or 9 inches across . And...I in our individual, early childhoods, we both went to *One room* school houses , for a short time. I miss by a little... We've always had a tv, even if all we had was black and white until I was about 8. I learned to type on an old Brother Typewriter handed down from my aunt. My grandparents had a party line until the late 70s...small town life. I took baths in an old galvanized steel tub at my maternal grandparents until my uncle updated their bathroom in 71. Thank you. I passed it on. Madison and her Mom's, Melissa's birthday was yesterday. Melissa worked really hard to have a nice birthday for Madison. A couple of weeks ago some one gave Melissa a toy power car. Emmi was driving, Seth was on the hood. I yelled for Seth to get down. Tammy and Melissa said he was fine. Melissa said he had been ridding on the hood for several day, of course not even five min. latter Seth fell off, face first on the black top. LOTS of blood. Melissa and Tammy took him to E.R. Madison was upset because her Mom had to leave. I talked to her. She understood why Melissa left, but was still up set she was not there. I held her and let her cry for about five min. then she asked if she could give out party favors. She was fine after that. I took a lot of pics. Madison had to go back to her Dads about 7:00. Mom, who could not get into Melissa's trailer needed to use bathroom. So we took Madison home. By now it was dark and cold. We took turns sitting in the van with Mom. We could not leave until they got back for the E.D. Seth feel about 4:30. Seven stitches latter they finally made it back to Melissa's about 10:00. I had promised to babysit the two little kids. By the time we got home Seth was waking all the way up, after being sedated, and wanted to play. Emmi had taken a very late short nap and wanted to play. I got them to sleep around 1:00 am. This A.M. Seth was fine. He and Emmi decided to play not listening. They both kept getting into trouble for not listening. They got into a pushing match over who was going to close the kitchen door. Then Seth kept sitting on Emmi. Emmi kept complaining. I told Seth three times not to sit on Emmi. Then he got a time out. I threatened his life if he got on her again. The second I let him up, Emmi got on her hands and knees and told Seth to get on her. She did it to get Seth in trouble. It back fired. When she got out of time out she was back in time out for yelling at me. I was VERY, VERY glad to take them home. When we got to Melissa's house we made her come out to the van to open her birthday presents from Kibby, Hubby and me. She said we weren't right (in the head). A couple of years ago Melissa had a BIG problem with bed bugs. Kibby got her a bed bug game. Hubby and I got her new sheets. Melissa laughed and said we were just not right. My new granddaughter was born at 3:39 this morning!! 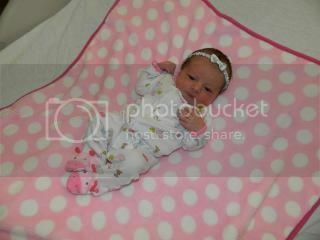 She weighed 7 lb, 13 oz. I haven't gotten to see her yet, because I'm staying with her two big brothers while her parents are with her at the hospital!! And no, I didn't want to take them to meet their new sister. They are entirely too rambunctious to deal with in a hospital setting! Especially the 2 yr old! My son and dil should be bringing my granddaughter home tomorrow, late morning or early afternoon and I can't wait to meet her! Congratulations Kevia ...hope you get to see her soon...enjoy her I have two grand-daughters and it's been wonderful watching them growing up. 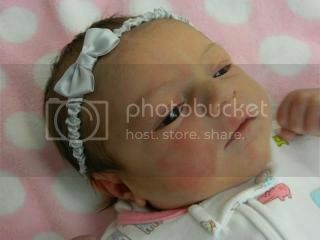 Here are a couple pictures of our new granddaughter. Her parents brought her home this afternoon and I got to spend a little time holding her. I'm sure those of you who are grandparents know this, but the first time I meet each grandchild, I fall in love. It is an amazing thing. I always know I will love them, in fact I already love them. But when I actually meet them, I'm overcome with emotion and falling in love is the best description I can come up with to describe what I'm experiencing. This is coming from a man who usually can't stand kids. My youngest niece has gotten into more trouble than she has ever gotten into before. Which is saying a lot for Emmi. This is the same child who played pool. She and her little brother stopped up the drains and turned the water on until the bathroom was flooded. That is just one small example of what she has done. Emmi stays more What she did today was so much worse. She was suppose to be taking a nap. When Melissa laids down Emmi was asleep. Emmi woke up found her mother's car keys from where they were hidden. Unlocked the front door. Got into the van and started it. She then put it in reverse and ended up in the neighbor's yard. She is only 4 years old. All the doors were locked. The keys were hidden. I don't know what else Melison can do to keep Emmi safe. Thanks, Draco. That means a lot "coming from a man who usually can't stand kids." Thank you, Moonlady and Mawra. Needless to say, I agree that she is beautiful! Thanks, Hans. I did tell them that they make beautiful babies!